Great chance to meet and walk with Olympic winning athlete Sonia O' Sullivan this Saturday in Ratoath at the Action Breast Cancer 5km Walk. 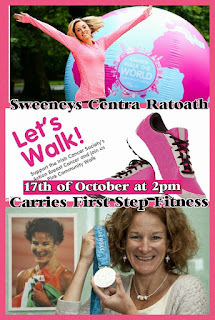 17th of October as there is a fantastic line-up planned for the Action Breast Cancer 5km Walk. There will be a marquee set up with lots of entertainment, a DJ to keep us all on our toes plus food & refreshments. This really will be fantastic for Ratoath. Come out & support this great cause.